If you don’t know the work of Asghar Farhadi, you should. A major figure in Iranian cinema, Farhadi won an Academy Awarding for A Separation, a movie he followed with The Past, a complex family and cultural drama set in France. Gifted and smart, Farhadi is one of the few directors working today who makes believable movies about adults. He’s also particularly skilled at conjoining personal and social issues in ways that allow us to look deeply into both the souls of his characters and the social pressures they face. 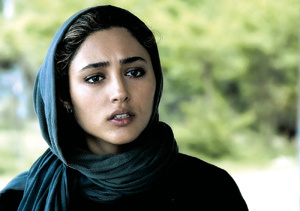 About Elly previewed at the Berlin Film Festival in 2009, but only now is finding its way to the U.S. It’s Farhadi’s fifth movie, and we’re lucky that the distribution problems that kept it from us have been resolved. The story couldn’t be simpler: A group of friends travel from Tehran to spend a weekend at the seaside. Among other things, they seem eager to find a match for one of their number, a young man (a fine Shahab Hosseini) who recently returned from Germany and is recovering from a bitter divorce. The target for the young man: the beautiful but shy Elly (Teraneh Alidoostie), the teacher of one of the couple’s kids. When the group arrives at the resort, they learn there’s a problem with the house they were supposed to occupy; they solve their problem by taking a rundown, abandoned beach house that they’ll have to clean during their three-day stay. The house has no heat, and evenings by the shore can be chilly, but the three couples talk themselves into persevering. At first, the ebullience and good humor of Farhadi’s middle-class characters made me wonder whether I was in for an Iranian Big Chill. The mood is one of cordiality and fun. The kids are cute. In the evening, everyone gathers for charades. We relax into the movie, even though suggestions of tension arise. Of course, the story can’t remain in this faux middle-class Eden forever. The near-drowning death of one of the kids sets up the movie’s central conceit: Elly disappears from the beach. Has she drowned in an effort to save the boy? Has she returned home? Why was she insisting on leaving before the weekend was done? As the group tries to unravel what happened, trouble beneath the happy surface emerges. Not only do we understand all of the characters better as the movie progresses, but we begin to see that they may not be quite as liberated as they thought. All the performances are good, but the work of Golshifteh Farahani qualifies as exceptional: She plays Sepideh, the woman who’s most tormented by the unfolding events. Toward the end, Farhadi’s screenplay may have a bit too much on its plate, but About Elly stands as another fine achievement from someone who’s emerging as one of the world’s most important directors.